Green Tea and Weight Loss – Myths and Facts! 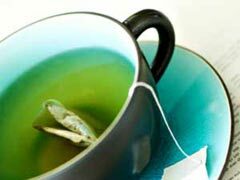 Green tea and weight loss have been linked for a while now in diet studies. Green tea, originated in China, is made from the plant Camellia Sinensis. The same plant produces not only all green tea, but also white, black, and oolong teas. The difference is the amount of oxidation each leaf goes through. For example black tea has full oxidation, oolong has a shorter oxidation, and green tea remains steamed and does not go through oxidation. The leaves are instead steamed to preserve oxidants and then the leaves are rolled. The distinction of different sorts of green tea is quite important, because it depends on growing conditions or harvest time. Green tea extract benefits are plentiful. It is quite the nutritious tea, offering ascorbic acid, minerals, zinc, selenium, and phytochemicals. Black tea has less antioxidants, in comparison. Myth: Both green tea and black tea have similar fat burning properties, and hence, could both be used for weight loss aid. Fact: Although research showed that when a high fat diet in mice was supplemented with a 5 percent black tea extract, the mice appeared to have had a reduced amount of fat stored in the liver, and the weight gaining process had been slowed down, no such evidence had been noted in humans. Green tea and weight loss benefits have, in fact, been tested in clinical studies on both animals and humans. Green tea has more healthy polyphenols, or natural antioxidants, than black tea since the fermentation process in black tea destroys most of the healthy polyphenols. Green tea has the highest amount of EGCG, a subgroup of polyphenols that is exclusive to green tea. 200 times more powerful than vitamin E, EGCG is considered to be a ‘super antioxidant’. Myth: Green tea dehydrates and, hence, compromises the weight loss process. Fact: Green tea is only ever better for the system than water by itself because of added health benefits. The caffeine content is not high enough to dehydrate. Myth: Drinking green tea every day will help suppress appetite. Fact: Research shows that because healthy polyphenols in green tea, which are responsible for activation of metabolism boosting properties in green tea, have a short life span of roughly 3 hours, drinking green tea once a day may not be enough to help your body lose weight. This is why the researchers actually recommend drinking green tea a minimum of 8 times a day! Myth: Green tea in liquid form is the only and best way to raise metabolic rate. Fact: Green tea and weight loss doesn’t always have to come in liquid format. Green tea can be ingested in a pill variety, or in the format of Matcha green tea powder. When a dry mix is formed, a green tea infusion of extra strength is melded into 50% solids. Then the solids are sprayed and become dehydrated extract and powder. The extract has inert processing help, to turn into different uses such as tablets, capsules, etc… Usually, Green tea supplements are accessible over the counter and the average extract is 90% total polyephenols. One capsule is also about five cups of tea. The benefits of green tea extract are related to new research about green tea and weight loss connection. A clinical study carried out at one of the renowned Universities of Geneva in 1999 concluded that individuals who consumed caffeine and green tea extract at the same time, burned more calories than those who took caffeine exclusively. Green tea can be arguably the best tea for weight loss. Studies on green tea and weight loss tested both animals and humans to suggest that green tea can reduce cardiovascular disease and kidney stones, as well. The link is also made with heart health, showing a reduction in heart disease and reduction in LDL cholesterol. At the University of Birmingham, it was noted that the fat oxidation levels were 17% higher after drinking green tea than if nothing was ingested. There is also a noted improvement in insulin sensitivity and glucose tolerance in young men. Green tea side effects do exist, but they aren’t usually very threatening. The main trigger which can cause sensitivity is caffeine. Caffeine – sensitive individuals might experience restlessness, and irritability. They will have some sleeping problems, or feel slight heart palpitations. There might also be loss of appetite experienced, and if one is very sensitive, also an upset stomach. As seen, green tea and weight loss benefits are quite real when the tea is consumed several times daily, so go ahead and enjoy a cup of tea with your every meal or during tea breaks at work! Four Weight Loss Tea Names You Should Know!